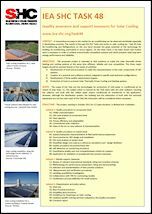 This synthetic brochure is intended to present the main results of the Task. 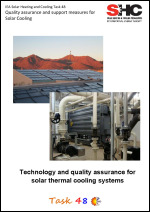 This brochure underlines what was the methodology used to progress on the development of quality procedures for solar cooling and what are the results on creation of tools for policy support. 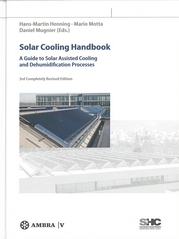 This book in English is the absolute reference on the subject of solar thermal air conditioning. Very detailed, it is the result of the work of Task Group 48 of the IEA SHC program and has more than 350 pages in all aspects of technology: components, the system and its design approach, the economic analysis of technology and finally the feedback of field experience for both small and large systems. All sorption technologies are discussed and each time by scientists from twenty participating countries. A tremendous increase in the market for air-conditioning can be observed worldwide especially in developing countries. 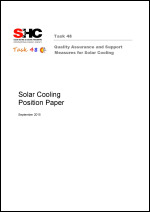 The results of the past IEA SHC Tasks and works on solar cooling (ex : Task 38 Solar Air-Conditioning and Refrigeration) on the one hand showed the great potential of this technology for building air-conditioning, particularly in sunny regions. On the other hand, it has been shown that further work is necessary in order to achieve economically competitive systems and which presents solid long term energy performance and reliability.